Welcome in the Alps at over 2000 m.
This charming hotel and restaurant offers a high quality service in a very idyllic and romantic region. It's a natural protected and leasure area, a hunting territory and a mountain pastures are nearby. Just aprox 50min by car from Sion, the capital of Valais, away, you will find this peaceful and relaxing area of the Sanetsch mountain pass, Tsanfleuron Glacier and the dam of Sanetsch. Weisshorn, Zinalrothorn, Dent-Blanche, Matterhorn and Dent d'Hérens. You have to see this paradise on earth! 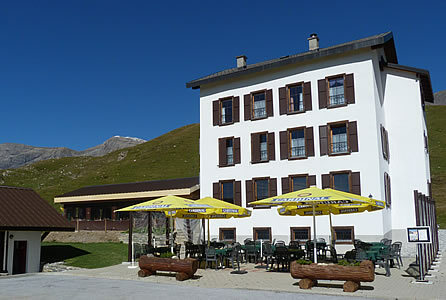 The Hôtel-Restaurant du Sanetsch is now open until October. > Virtuel view of this nice location ?